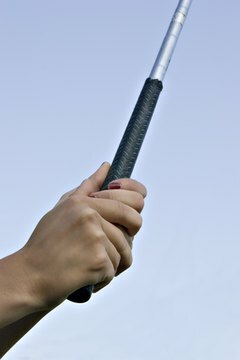 Improper grips, swings or not using a golf glove can cause hand injuries. While injury risks in golf are low, the sport is not without its potential pitfalls. A common area for a golfer to feel pain after a round of golf is in his hands, which can come under strain when a golfer misplays a ball. These injuries require various forms of treatment. Acute injuries occur as the result of a single jarring impact, which leads to either a bone fracture or a strain or tear in one of the hand muscles or tendons. While these injuries are uncommon, they can be painful. Cumulative injuries develop as a result of repeated minor strains placed on the body with every swing. These often appear as inflammation and aches in the hand joints. Breaks are uncommon in golfers, as the game is relatively low-impact when you strike the ball properly. When they occur, however, they are painful and may require extensive care. The most common hand break in golf occurs when a ball is struck fat, meaning the player hits the ground behind the ball, jarring the shaft. When the club is held too high on the shaft, so that none of the shaft extends out of the top of the hands, the top of the shaft drives into the hand and may break it. Such an injury often requires surgery to repair delicate hand bones. Tendon injuries are more common than breaks, and while they can result from a traumatic incident, they more commonly occur because of the cumulative strain of repeated swings. Injuries to tendons are less likely to require medical attention such as surgery, and often are treated with simple measures. Icing an injured hand after a round will help numb the pain and reduce the swelling. Stretching the tendons before a round can lower the risk of injury during the round, and rest is effective if hand pain occurs progressively earlier in each round.